After my last post pointing out that Vauxhall featured pretty heavily in the slowest selling cars of the new year among the likes of the Suzuki SX4, it looks like they are trying everything to try and redeem their sales. 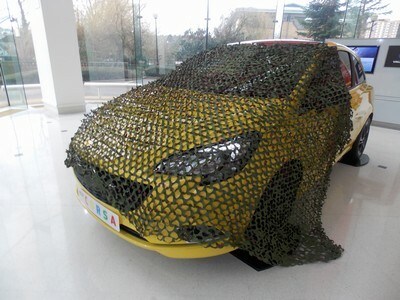 Queue the Camo-net, a new accessory that will be offered with Corsas bought in the Flaming Yellow, Flame Red, Lime Green and Chilli Orange colours. I know I painted a picture of different foreign cars being at war, but Vauxhall may be taking things a little too far with this latest edition. It is possibly the oddest gimmick I have ever heard of, I can’t imagine anyone at all, thinking you know what, I’m going to pick the Corsa over that other car because, well, Camo-Net. If anything it might put you off, I mean, where would you put it when you inevitably stop using it because the novelty factor ran out the moment you drove the car out of the forecourt, probably before that actually. Obviously it is an attempt on Vauxhalls part to be funny and is apparently in response to complaints made by tourists visiting the village of Bibury in Gloucestershire who complained that an 82-year old, Peter Maddow’s Yellow Corsa, was spoiling the picturesque view. It could of been worse, Peter could have been driving a Renault Grand Scenic, no amount of camouflage could shield you from that monstrosity.